I love the BB10 OS, but the app support just isn't there. The way they implemented peak and flow is awesome, and the integration of the BB Hub is superb. I've had the Passport since it came out (I switched from an S3). I kind of like not having many apps, as I don't tend to waste as much time staring at the screen. Unfortunately the OS is basically in maintenance mode now and all BlackBerry devices moving forward are running Android (PRIV, Dtek50, Dtek60, Aurora, KEYone). The last phone manufactured by them was the PRIV. The newest phone, the BlackBerry KEYone is actually manufactured by BlackBerry Mobile, which is basically a subsidiary of TCL who makes Alcatel phones. The Auroura is only available in Indonesia I believe and has been manufactured by a different company. Both TCL and the other company just license the name and BlackBerry provides the OS. I'll be posting an android screen shot here eventually as I won a KEYone in a contest put on by crackberry, but the device availablility is extremely limited right now so I'm stuck waiting. spend a day hacking at it to make it suit my needs, even managed to recompile (had to comment out those damn graph borders) - i might become an android script kiddie yet! i'm using it in combination with this, which gives excellent information about processes, network usage etc. - much more than moss or even conky ever could offer. Does Moss require root? I'm going to be getting a BlackBerry KEYone hopefully soon and that looks like it's be useful! ^ i don't think so. there's .apks on play.google and f-droid.org. it installs as a live wallpaper. it's a "normal" android java program that emulates conky syntax and conky config files, with a few differences, some of which undocumented. looking at the provided sample configs to figure out what's going on will be necessary. As soon as I have my phone I'll give it a whirl! I'm not super familiar with conky as I'm using i3 in BL, but i'll give it a go. I got my new phone yesterday. BlackBerry KEYone, running Android 7.
so far I am loving this phone, but I have been unable to find that Moss program on Google Play. I'm still relearning Android after having been with BB10 for the last 2.5 years. I'm also by no means done setting up my screen, that's just where it happens to be at now. I'm looking forward to figuring out what I could possibly use the 52 keyboard shortcuts fo, haha. Thanks! I've downloaded f-droid, but don't see the apk either there or on Google play. Is there a specific repository I have to add to f-droid? how weird is that, it seems they took it down. Compiling from source wasn't too hard, but anyhway, I added a compiled .apk to my fork. Let me know how/if it works. Ha, thanks! I downloaded the apk and enabled installation from other sources but I get an error parsing the package. I'll try and dig into it some more since it's probably my phone causing the trouble. BlackBerry hardened their version of android which might cause an issue. i doubt i'll be able to do much, though. it installs on my kitkat phone. maybe it won't work on newer android versions (maybe you need to compile it yourself, with updated settings). maybe blackberry has additional security stuff enabled. maybe you can sign the package (i might look into that myself if that turns out to be the problem). How would I go about creating a Solarized inspired colour scheme for an Android device? ^ How about http://www.androidstudiothemes.com/them … ized-light? EDIT: no, that's not it, sorry. unfortunately it is much, much harder than on gnu/linux. also it probably depends on the android version. on my (horribly outdated) kitkat 4.4.2, i guess i'd try it via xposed first. apart from that, there's this app that is being featured on xda-developers all the time, tasker or maybe also themr (sic). iirc, they're not completely free (as in beer). if you're serious about this, start digging deep in & around xda-developers! 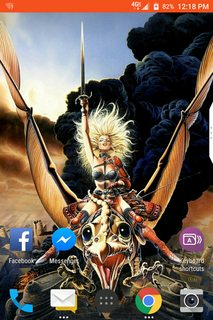 That wallpaper takes me back to watching that movie as a teenager and just being in awe. Even today when I watch it (once or twice a year), it still blows me away.